This conditioning spray from Schwarzkopf's Bonacure Color Freeze range is designed specifically to get the best from colour-treated hair and its light weight means it doesn't feel over burdening. It's suitable for daily use and formulated with reactive silane to lock in vibrant colour and shine meaning that up to 90% of colour is retained between salon visits with 100% more shine. 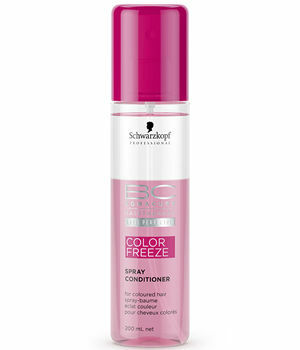 Schwarzkopf BC Bonacure Color Freeze Spray Conditioner comes in a 200-ml bottle. £6.53 (inc. VAT) Why no VAT? We're a trade wholesaler and quote our prices without VAT to help our VAT-registered customers understand the true cost of a purchase.